How do I create a new IPv6-record? If your own server or external hosting is reachable through ipv6 you can create an IPV6 record in the DNS settings of your domain name. You can create the IPV6 record by following the steps below. You'll find more information about AAAA records in this article. 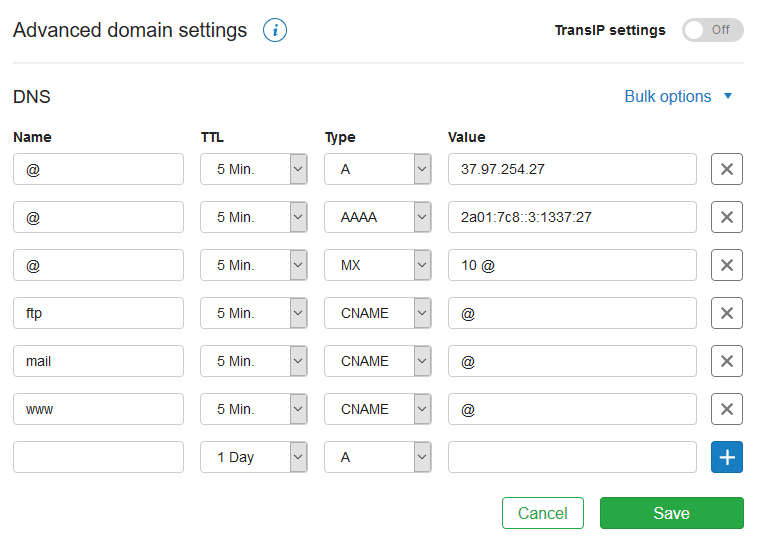 Log in to your TransIP control panel. Navigate to "Domain & Hosting". Click on your domain name in the left menu. Scroll down to "Advanced domain settings" (click Enable Advanced Settings if required). It takes a maximum of 24 hours (usually less) before external systems have processed the changes and have taken affect globally. Unfortunately we have no influence on the time these changes take. See this link for more information.